Remove the EVAP canister cover fasteners (1) and cover (2). Do not breathe the air through the EVAP component tubes or hoses. The fuel vapors inside the EVAP components may cause personal injury. Do not remove the fuel tank filler hose when the fuel tank is over half filled with fuel. 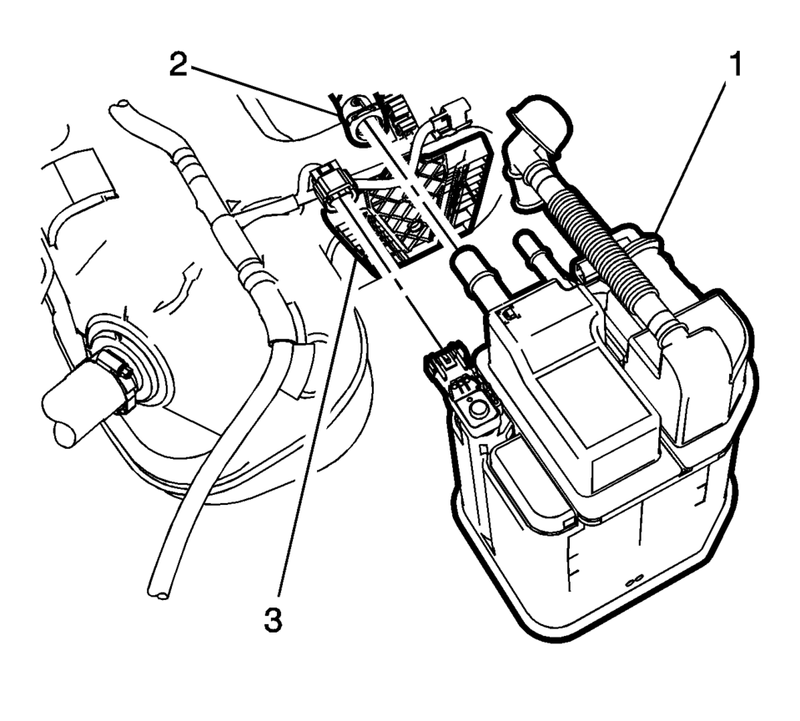 Remove the evaporative emissions fill vent pipe connector(1) and loosen the fuel filler hose clamp (2). If the fuel level is over half filled, refer to Fuel Tank Draining. To help avoid personal injury, always use jack stands when you are working on or under any vehicle that is supported only by a jack. 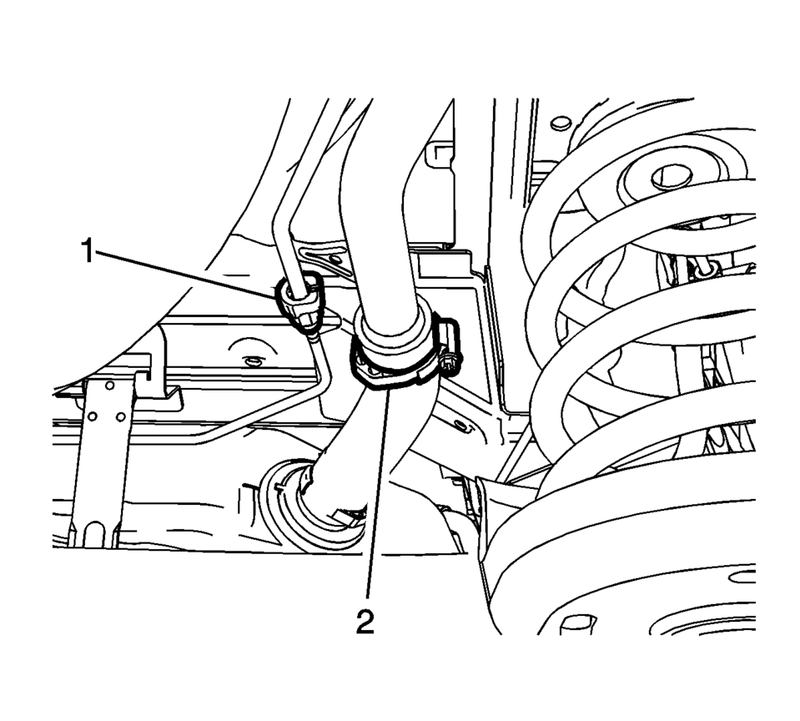 When you are jacking or lifting a vehicle at the frame side rails or other prescribed lift points, be certain that the lift pads do not contact the catalytic converter, the brake pipes or the fuel lines. If such contact occurs, vehicle damage or unsatisfactory vehicle performance may result. Place a suitable adjustable jack under the fuel tank. 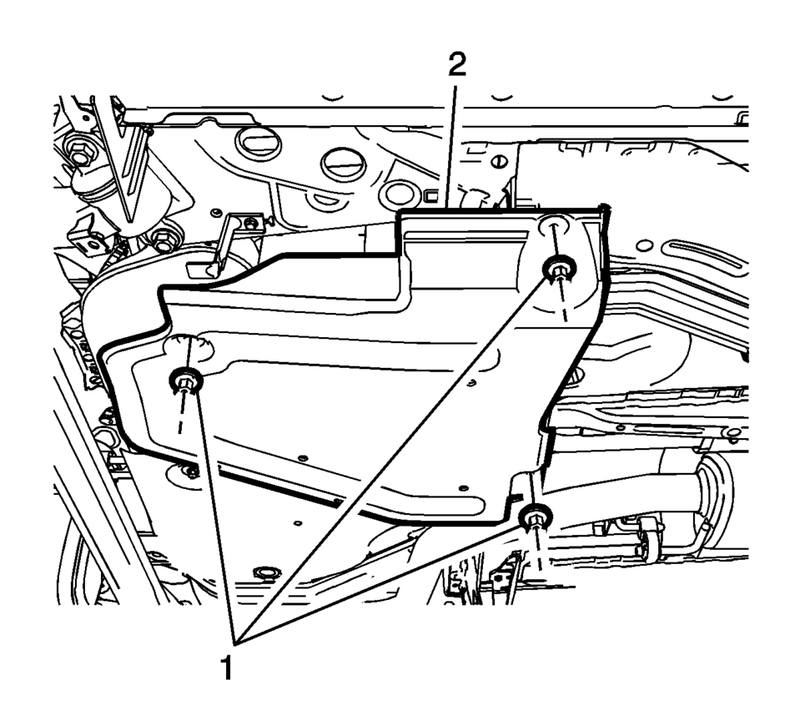 Remove the 2 fuel tank strap bolts (1). 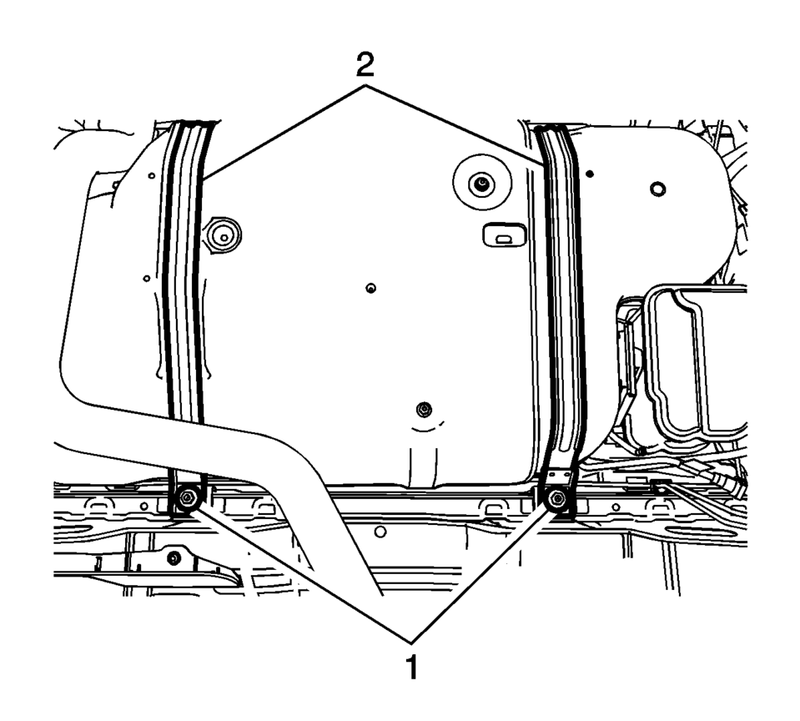 Remove the 2 fuel tank straps (2). 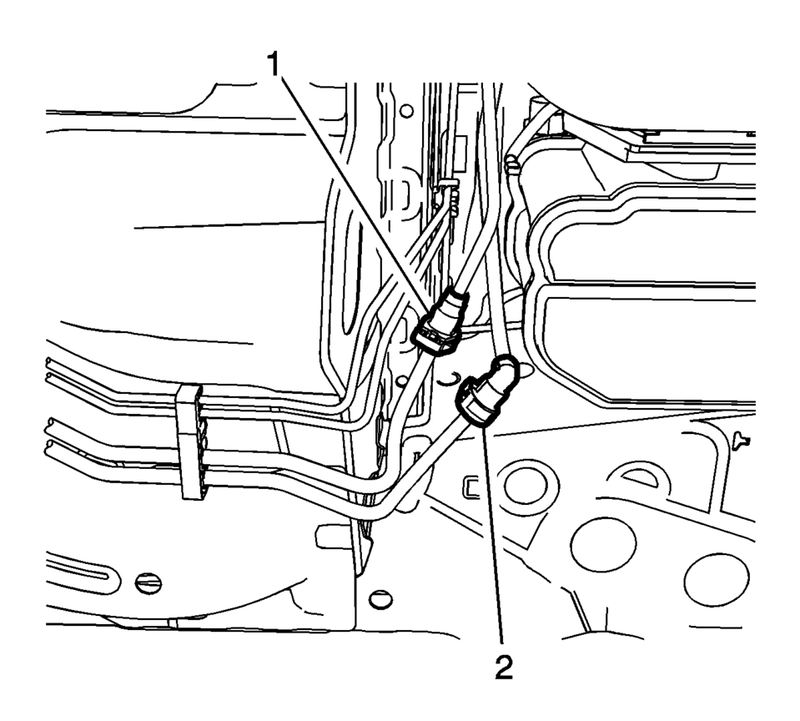 Disconnect the fuel feed (1) and the evaporative emissions pipe (2). Closely watch parts like pipes or hoses that are still installed to the fuel tank. If lowering the fuel tank slightly does not provide enough access to remove the fuel tank, refer to Fuel Tank Replacement. Lower the fuel tank to a height where the evaporative emission canister is easily accessible. Always wear safety goggles when working with fuel in order to protect the eyes from fuel splash. Disconnect the fuel tank vent pipe (2). Disconnect the evaporative emission canister wiring harness connectors. Disconnect the evaporative emission canister purge pipe (4). Remove the evaporative emission canister (1) from the evaporative emission canister bracket (3). Install the evaporative emission canister (1) to the evaporative emission canister bracket (3). Connect the evaporative emission canister purge pipe (4). Connect the evaporative emission canister wiring harness plug. Connect the fuel tank vent pipe (2). Raise the fuel tank to its original position. Connect the fuel feed (1) and the evaporative emissions pipes (2). Install the 2 fuel tank straps (1). Connect the evaporative emissions fill vent pipe connector(1). Install the EVAP canister cover (2).